Tag line: "A picture that goes beyond what men think about - because no man ever thought about it in quite this way!" When the great Italian director, Federico Fellini, found himself at a difficult crossroads in his career, having suddenly, and without reason, lost his desire to make films, he did what any brilliant filmmaker would do in his place: he made a movie about a director who’d lost his desire to make films! 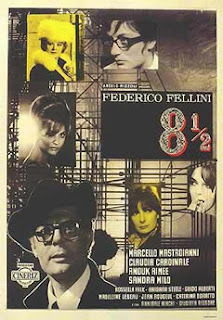 More than a little autobiographical, Fellini's 8 ½ follows Guido Anselam (Marcello Mastroianni), a revered movie director whose passion for the art has inexplicably abandoned him. What's worse, his next picture has already been financed! In the hopes of regaining his muse, Guido steals away to a health spa, and invites both his mistress (Sandra Milo) and wife (Anouk Aimée) to join him. Yet even here, he doesn’t get a moments peace, bothered at all hours by angry producers, frustrated actresses and confused assistants, all of whom are demanding Guido begin work on what will surely be his newest cinematic masterpiece. 8 ½ is stockpiled with fantastic scenes, and perhaps the greatest is the dream sequence that opens it, in which Guido is behind the wheel of his car, stuck in an endless traffic jam. While sitting there, motionless, he notices the car filling up with smoke, and as he struggles to get out, the motorists in the vehicles surrounding him stare on, neither offering assistance nor showing the slightest concern for his well-being. He manages to escape, then suddenly takes to the air, floating above the other cars and away from the traffic. Soon, he’s flying over the open sea, but his freedom is to be short lived, because before he can fly off, he's pulled back to earth by several of his assistants, yanking a rope that's appeared around his leg. The sequence ends with Guido falling towards the water, waking up just before he hits it. It’s a marvelously surreal beginning to a marvelously surreal film, and all at once, we understand Guido’s mindset, his longing to break away from the producers, actors and costume designers who hound him hourly. We’re already in tune with Guido’s plight, and things are just getting started. I’m a sucker for films like 8 ½, movies that walk a fine line between fantasy and reality, shifting from one to the other with inspired ease. While I both admire and enjoy his earlier, "realistic" pictures (Nights of Cabiria, La Strada), I find Fellini's later works (Roma, La Dolce Vita, Amarcord) much more exciting. With their visual expression, the director pushes film making to its extreme, creating carnival-like images presented within a highly personal narrative. There is a story here, that of a man struggling with his art (In the world of 8 ½, the director is not merely a technician, but an artist, and even a celebrity), yet Fellini realizes motion pictures are more than just plot; they're a medium for the senses. And with 8 ½, he does a fine job of exciting them. A fantastic review of one of my favourite films!